The Final Cut is set in a future in which an individual may have a recording chip placed in their head before they are born which will then record every moment of their life. Following their death these recorded memories are cut together like a movie by individuals known as Cutters, and are then played at the funeral as a “Rememory”. Robin Williams plays Alan Hakman a talented Cutter (haunted by a childhood incident) who is sought after by the family of one of them men responsible for the recording technology. However there are other forces at work, namely former Cutter Fletcher (Jim Caviezel) who wants to bring stop the practice of Rememory and hopes the recorded memories of the deceased will contain incriminating information that will help him do it. 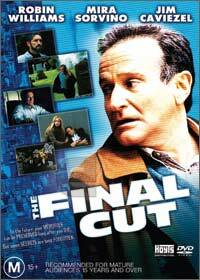 The Final Cut offers up an intriguing premise; How do you judge what is worth remembering about a person? Shouldn’t people have a say in how they are remembered? What about the rights of the child that has the chip implanted into them without their consent? How does the knowledge of the chip change the way a person lives their life? All intriguing questions that are not answered nor explored as fully as they could be as the film is confused about what it wants to be, a futuristic thriller or an examination of the life of a man who watches others people’s lives for a living. Whilst the subplot about Alan’s childhood is resolved, the larger issues presented are left hanging as The Final Cut ends somewhat abruptly and predictably following the quite obvious twist. Despite this however the film is enjoyable on its own, but one is left wondering how much better it would have been had the larger questions raised been followed through on. Robin Williams puts in a fine performance as the man watches others lives for a living but has no true life of his own. Caviezel is a menacing villain/anti-hero, with Mira Sorvino rounding out the main cast in a role that is never fully explored. Such a pity the fine cast were not given more to work with which would have made The Final Cut a cut above other films in the genre.